[S67] Town of Montezuma Records, online http://web.archive.org/web/20020212104157/http://…, (Waybackmachine), Aug 27, 1934 George L. Lum George Lum Margaret O'Brien Catherine J. Thurston Hiram Thurston Catherine VanVleck. Margaret O'Brien married George Lum. George Lum married Margaret O'Brien. [S26] 1900 United States Federal Census, online , Year: 1900; Census Place: Auburn Ward 10, Cayuga, New York; Roll: T623_31077_4114483; Page: 9B; Enumeration District: 0020; FHL microfilm: 1241012. [S68] 1915 New York, State Census, online , New York State Archives; Albany, New York; State Population Census Schedules, 1915; Election District: 01; Assembly District: 01; City: Mentz; County: Cayuga; Page: 29. [S61] 1930 United States Federal Census, online , Year: 1930; Census Place: Auburn, Cayuga, New York; Roll: 1411; Page: 16A; Enumeration District: 11; Image: 178.0; FHL microfilm: 2341146. [S66] 1925 New York, State Census, online , New York State Archives; Albany, New York; State Population Census Schedules, 1925; Election District: 03; Assembly District: 01; City: Auburn Ward 06; County: Cayuga; Page: 14. [S26] 1900 United States Federal Census, online , Year: 1900; Census Place: Throop TN, Cayuga, New York; Roll: 1013; Page: 5A; Enumeration District: 0046; FHL microfilm: 1241013. [S65] 1920 United States Federal Census, online , Year: 1920; Census Place: Auburn Ward 6, Cayuga, New York; Roll: T625_1089; Page: 13A; Enumeration District: 10; Image: 397. [S2] 1880 United States Federal Census, online , Year: 1880; Census Place: Auburn, Cayuga, New York; Roll: 814; Family History Film: 1254814; Page: 388A; Enumeration District: 041; Image: 0698. [S570] Ancestry.com, U.S., World War II Draft Registration Cards, 1942 (n.p. : Ancestry.com Operations, Inc., unknown publish date), National Archives and Records Administration (NARA); Washington, D.C.; State Headquarters: Pennsylvania; Microfilm Series: M1951; Microfilm Roll: 209. [S26] 1900 United States Federal Census, online , Year: 1900; Census Place: Camillus, Onondaga, New York; Roll: 1134; Page: 6B; Enumeration District: 0037; FHL microfilm: 1241134. Her married name was Mead. Rosetta (?) was born in April 1872 at New York, USA.1,2 She married Abel Mead in 1890.1 Rosetta (?) lived in 1900 at Camillus, Onondaga, New York, USA; Age: 28Marital Status: Married; Relation to Head of House: Wife.1 She lived in 1910 at Montezuma, Cayuga, New York, USA; Age in 1910: 36Marital Status: Married; Relation to Head of House: Wife.2 She married Joseph Henry Rice, son of Joseph H. Rice and Mary Whitmore. [S26] 1900 United States Federal Census, online , Year: 1900; Census Place: Camillus, Onondaga, New York; Roll: T623_31077_4114707; Page: 6B; Enumeration District: 0037; FHL microfilm: 1241134. [S87] Ancestry.com, U.S., World War I Draft Registration Cards, 1917-1918 (n.p. : Ancestry.com Operations Inc, unknown publish date), Registration State: New York; Registration County: Onondaga; Roll: 1819042; Draft Board: 2. [S26] 1900 United States Federal Census, online , Year: 1900; Census Place: Cato, Cayuga, New York; Roll: 1012; Page: 15A; Enumeration District: 0025; FHL microfilm: 1241012. 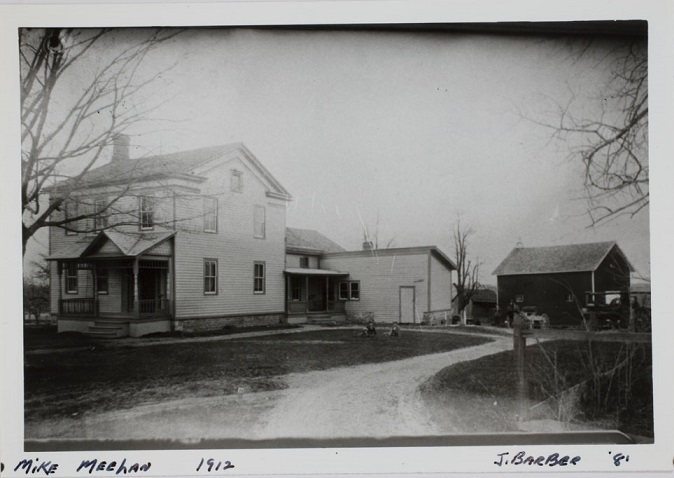 [S2] 1880 United States Federal Census, online , Year: 1880; Census Place: Ira, Cayuga, New York; Roll: 814; Family History Film: 1254814; Page: 101D; Enumeration District: 023; Image: 0124. [S26] 1900 United States Federal Census, online , Year: 1900; Census Place: Seneca Falls Ward 2, Seneca, New York; Roll: 1162; Page: 14B; Enumeration District: 0094; FHL microfilm: 1241162. [S87] Ancestry.com, U.S., World War I Draft Registration Cards, 1917-1918 (n.p. : Ancestry.com Operations Inc, unknown publish date), Registration State: New York; Registration County: Wayne; Roll: 1819124; Draft Board: 2.